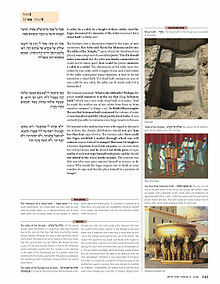 This article is about the Babylonian Talmud. For the Jerusalem Talmud, see Jerusalem Talmud. "Talmudic" redirects here. "Talmudic Aramaic" refers to the Jewish Babylonian Aramaic as found in the Talmud. The Talmud (/ˈtɑːlmʊd, -məd, ˈtæl-/; Hebrew: תַּלְמוּד talmūd) is the central text of Rabbinic Judaism and the primary source of Jewish religious law (halakha) and Jewish theology. Until the advent of modernity, in nearly all Jewish communities, the Talmud was the centerpiece of Jewish cultural life and was foundational to "all Jewish thought and aspirations", serving also as "the guide for the daily life" of Jews. The term "Talmud" normally refers to the collection of writings named specifically the Babylonian Talmud (Talmud Bavli), although there is also an earlier collection known as the Jerusalem Talmud (Talmud Yerushalmi). It may also traditionally be called Shas (ש״ס), a Hebrew abbreviation of shisha sedarim, or the "six orders" of the Mishnah. The Talmud has two components; the Mishnah (Hebrew: משנה, c. year 200 CE), a written compendium of Rabbinic Judaism's Oral Torah; and the Gemara (circa year 500 CE), an elucidation of the Mishnah and related Tannaitic writings that often ventures onto other subjects and expounds broadly on the Hebrew Bible. The term "Talmud" may refer to either the Gemara alone, or the Mishnah and Gemara together. The entire Talmud consists of 63 tractates, and in standard print is over 6,200 pages long. It is written in Mishnaic Hebrew and Jewish Babylonian Aramaic and contains the teachings and opinions of thousands of rabbis (dating from before the Common Era through to the fifth century) on a variety of subjects, including halakha, Jewish ethics, philosophy, customs, history, lore and many other topics. The Talmud is the basis for all codes of Jewish law, and is widely quoted in rabbinic literature. Talmud translates as "instruction, learning", from a root LMD "teach, study". The process of "Gemara" proceeded in what were then the two major centers of Jewish scholarship, Galilee and Babylonia. Correspondingly, two bodies of analysis developed, and two works of Talmud were created. The older compilation is called the Jerusalem Talmud or the Talmud Yerushalmi. It was compiled in the 4th century in Galilee. The Babylonian Talmud was compiled about the year 500, although it continued to be edited later. The word "Talmud", when used without qualification, usually refers to the Babylonian Talmud. While the editors of Jerusalem Talmud and Babylonian Talmud each mention the other community, most scholars believe these documents were written independently; Louis Jacobs writes, "If the editors of either had had access to an actual text of the other, it is inconceivable that they would not have mentioned this. Here the argument from silence is very convincing." The Jerusalem Talmud, also known as the Palestinian Talmud, or Talmuda de-Eretz Yisrael (Talmud of the Land of Israel), was one of the two compilations of Jewish religious teachings and commentary that was transmitted orally for centuries prior to its compilation by Jewish scholars in the Land of Israel. It is a compilation of teachings of the schools of Tiberias, Sepphoris and Caesarea. It is written largely in Jewish Palestinian Aramaic, a Western Aramaic language that differs from its Babylonian counterpart. This Talmud is a synopsis of the analysis of the Mishnah that was developed over the course of nearly 200 years by the Academies in Galilee (principally those of Tiberias and Caesarea.) Because of their location, the sages of these Academies devoted considerable attention to analysis of the agricultural laws of the Land of Israel. Traditionally, this Talmud was thought to have been redacted in about the year 350 by Rav Muna and Rav Yossi in the Land of Israel. It is traditionally known as the Talmud Yerushalmi ("Jerusalem Talmud"), but the name is a misnomer, as it was not prepared in Jerusalem. It has more accurately been called "The Talmud of the Land of Israel". Its final redaction probably belongs to the end of the 4th century, but the individual scholars who brought it to its present form cannot be fixed with assurance. By this time Christianity had become the state religion of the Roman Empire and Jerusalem the holy city of Christendom. In 325, Constantine the Great, the first Christian emperor, said "let us then have nothing in common with the detestable Jewish crowd." This policy made a Jew an outcast and pauper. The compilers of the Jerusalem Talmud consequently lacked the time to produce a work of the quality they had intended. The text is evidently incomplete and is not easy to follow. The apparent cessation of work on the Jerusalem Talmud in the 5th century has been associated with the decision of Theodosius II in 425 to suppress the Patriarchate and put an end to the practice of semikhah, formal scholarly ordination. Some modern scholars have questioned this connection. Despite its incomplete state, the Jerusalem Talmud remains an indispensable source of knowledge of the development of the Jewish Law in the Holy Land. It was also an important resource in the study of the Babylonian Talmud by the Kairouan school of Chananel ben Chushiel and Nissim ben Jacob, with the result that opinions ultimately based on the Jerusalem Talmud found their way into both the Tosafot and the Mishneh Torah of Maimonides. Following the formation of the modern state of Israel there is some interest in restoring Eretz Yisrael traditions. For example, rabbi David Bar-Hayim of the Makhon Shilo institute has issued a siddur reflecting Eretz Yisrael practice as found in the Jerusalem Talmud and other sources. The Babylonian Talmud (Talmud Bavli) consists of documents compiled over the period of late antiquity (3rd to 5th centuries). During this time the most important of the Jewish centres in Mesopotamia, a region called "Babylonia" in Jewish sources and later known as Iraq, were Nehardea, Nisibis (modern Nusaybin), Mahoza (al-Mada'in, just to the south of what is now Baghdad), Pumbedita (near present-day al Anbar Governorate), and the Sura Academy, probably located about 60 km south of Baghdad. The Babylonian Talmud comprises the Mishnah and the Babylonian Gemara, the latter representing the culmination of more than 300 years of analysis of the Mishnah in the Talmudic Academies in Babylonia. The foundations of this process of analysis were laid by Abba Arika (175–247 CE), a disciple of Judah ha-Nasi. Tradition ascribes the compilation of the Babylonian Talmud in its present form to two Babylonian sages, Rav Ashi and Ravina II. Rav Ashi was president of the Sura Academy from 375–427. The work begun by Rav Ashi was completed by Ravina, who is traditionally regarded as the final Amoraic expounder. Accordingly, traditionalists argue that Ravina's death in 475 CE is the latest possible date for the completion of the redaction of the Talmud. However, even on the most traditional view a few passages are regarded as the work of a group of rabbis who edited the Talmud after the end of the Amoraic period, known as the Savoraim or Rabbanan Savora'e (meaning "reasoners" or "considerers"). There are significant differences between the two Talmud compilations. The language of the Jerusalem Talmud is a western Aramaic dialect, which differs from the form of Aramaic in the Babylonian Talmud. The Talmud Yerushalmi is often fragmentary and difficult to read, even for experienced Talmudists. The redaction of the Talmud Bavli, on the other hand, is more careful and precise. The law as laid down in the two compilations is basically similar, except in emphasis and in minor details. The Jerusalem Talmud has not received much attention from commentators, and such traditional commentaries as exist are mostly concerned with comparing its teachings to those of the Talmud Bavli. The Jerusalem Talmud covers all the tractates of Zeraim, while the Babylonian Talmud covers only tractate Berachot. The reason might be that most laws from the Order Zeraim (agricultural laws limited to the land of Israel) had little practical relevance in Babylonia and were therefore not included. The Jerusalem Talmud has a greater focus on the Land of Israel and the Torah's agricultural laws pertaining to the land because it was written in the Land of Israel where the laws applied. The Jerusalem Talmud does not cover the Mishnaic order of Kodashim, which deals with sacrificial rites and laws pertaining to the Temple, while the Babylonian Talmud does cover it. It is not clear why this is, as the laws were not directly applicable in either country following the Temple's 70 CE destruction. In both Talmuds, only one tractate of Tohorot (ritual purity laws) is examined, that of the menstrual laws, Niddah. The Babylonian Talmud records the opinions of the rabbis of the Ma'arava (the West, meaning Israel/Palestine) as well as of those of Babylonia, while the Jerusalem Talmud only seldom cites the Babylonian rabbis. The Babylonian version also contains the opinions of more generations because of its later date of completion. For both these reasons it is regarded as a more comprehensive collection of the opinions available. On the other hand, because of the centuries of redaction between the composition of the Jerusalem and the Babylonian Talmud, the opinions of early amoraim might be closer to their original form in the Jerusalem Talmud. The influence of the Babylonian Talmud has been far greater than that of the Yerushalmi. In the main, this is because the influence and prestige of the Jewish community of Israel steadily declined in contrast with the Babylonian community in the years after the redaction of the Talmud and continuing until the Gaonic era. Furthermore, the editing of the Babylonian Talmud was superior to that of the Jerusalem version, making it more accessible and readily usable. According to Maimonides (whose life began almost a hundred years after the end of the Gaonic era), all Jewish communities during the Gaonic era formally accepted the Babylonian Talmud as binding upon themselves, and modern Jewish practice follows the Babylonian Talmud's conclusions on all areas in which the two Talmuds conflict. The structure of the Talmud follows that of the Mishnah, in which six orders (sedarim; singular: seder) of general subject matter are divided into 60 or 63 tractates (masekhtot; singular: masekhet) of more focused subject compilations, though not all tractates have Gemara. Each tractate is divided into chapters (perakim; singular: perek), 517 in total, that are both numbered according to the Hebrew alphabet and given names, usually using the first one or two words in the first mishnah. A perek may continue over several (up to tens of) pages. Each perek will contain several mishnayot. The Mishnah is a compilation of legal opinions and debates. 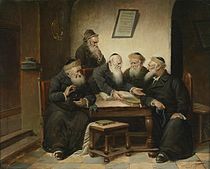 Statements in the Mishnah are typically terse, recording brief opinions of the rabbis debating a subject; or recording only an unattributed ruling, apparently representing a consensus view. The rabbis recorded in the Mishnah are known as the Tannaim. Since it sequences its laws by subject matter instead of by biblical context, the Mishnah discusses individual subjects more thoroughly than the Midrash, and it includes a much broader selection of halakhic subjects than the Midrash. The Mishnah's topical organization thus became the framework of the Talmud as a whole. But not every tractate in the Mishnah has a corresponding Gemara. Also, the order of the tractates in the Talmud differs in some cases from that in the Mishnah. In addition to the Mishnah, other tannaitic teachings were current at about the same time or shortly thereafter. The Gemara frequently refers to these tannaitic statements in order to compare them to those contained in the Mishnah and to support or refute the propositions of the Amoraim. The baraitot cited in the Gemara are often quotations from the Tosefta (a tannaitic compendium of halakha parallel to the Mishnah) and the Midrash halakha (specifically Mekhilta, Sifra and Sifre). Some baraitot, however, are known only through traditions cited in the Gemara, and are not part of any other collection. In the three centuries following the redaction of the Mishnah, rabbis in Palestine and Babylonia analyzed, debated, and discussed that work. These discussions form the Gemara. The Gemara mainly focuses on elucidating and elaborating the opinions of the Tannaim. The rabbis of the Gemara are known as Amoraim (sing. Amora אמורא). Much of the Gemara consists of legal analysis. The starting point for the analysis is usually a legal statement found in a Mishnah. The statement is then analyzed and compared with other statements used in different approaches to biblical exegesis in rabbinic Judaism (or – simpler – interpretation of text in Torah study) exchanges between two (frequently anonymous and sometimes metaphorical) disputants, termed the makshan (questioner) and tartzan (answerer). Another important function of Gemara is to identify the correct biblical basis for a given law presented in the Mishnah and the logical process connecting one with the other: this activity was known as talmud long before the existence of the "Talmud" as a text. In addition to the six Orders, the Talmud contains a series of short treatises of a later date, usually printed at the end of Seder Nezikin. These are not divided into Mishnah and Gemara. Within the Gemara, the quotations from the Mishnah and the Baraitas and verses of Tanakh quoted and embedded in the Gemara are in either Mishnaic or Biblical Hebrew. The rest of the Gemara, including the discussions of the Amoraim and the overall framework, is in a characteristic dialect of Jewish Babylonian Aramaic. There are occasional quotations from older works in other dialects of Aramaic, such as Megillat Taanit. Overall, Hebrew constitutes somewhat less than half of the text of the Talmud. This difference in language is due to the long time period elapsing between the two compilations. During the period of the Tannaim (rabbis cited in the Mishnah), a late form of Hebrew known as Rabbinic or Mishnaic Hebrew was still in use as a spoken vernacular among Jews in Judaea (alongside Greek and Aramaic), whereas during the period of the Amoraim (rabbis cited in the Gemara), which began around 200 CE, the spoken vernacular was almost exclusively Aramaic. Hebrew continued to be used for the writing of religious texts, poetry, and so forth. The first complete edition of the Babylonian Talmud was printed in Venice by Daniel Bomberg 1520–23 with the support of Pope Leo X. In addition to the Mishnah and Gemara, Bomberg's edition contained the commentaries of Rashi and Tosafot. Almost all printings since Bomberg have followed the same pagination. Bomberg's edition was considered relatively free of censorship. Following Ambrosius Frobenius's publication of most of the Talmud in installments in Basel, Immanuel Benveniste published the whole Talmud in installments in Amsterdam 1644–1648, Although according to Raphael Rabbinovicz the Benveniste Talmud may have been based on the Lublin Talmud and included many of the censors' errors. The edition of the Talmud published by the Szapira brothers in Slavuta in 1795 is particularly prized by many rebbes of Hasidic Judaism. In 1835, after an acrimonious dispute with the Szapira family, a new edition of the Talmud was printed by Menachem Romm of Vilna. Known as the Vilna Edition Shas, this edition (and later ones printed by his widow and sons, the Romm publishing house) has been used in the production of more recent editions of Talmud Bavli. A page number in the Vilna Talmud refers to a double-sided page, known as a daf, or folio in English; each daf has two amudim labeled א and ב, sides A and B (recto and verso). The convention of referencing by daf is relatively recent and dates from the early Talmud printings of the 17th century, though the actual pagination goes back to the Bomberg edition. Earlier rabbinic literature generally refers to the tractate or chapters within a tractate (e.g. Berachot Chapter 1, ברכות פרק א׳). It sometimes also refers to the specific Mishnah in that chapter, where "Mishnah" is replaced with "Halakha", here meaning route, to "direct" the reader to the entry in the Gemara corresponding to that Mishna (e.g. Berachot Chapter 1 Halakha 1, ברכות פרק א׳ הלכה א׳ would refer to the first Mishnah of the first chapter in Tractate Berachot, and its corresponding entry in the Gemara). However, this form is nowadays more commonly (though not exclusively) used when referring to the Jerusalem Talmud. Nowadays, reference is usually made in format [Tractate daf a/b] (e.g. Berachot 23b, ברכות כג ב׳). Increasingly, the symbols "." and ":" are used to indicate Recto and Verso, respectively (thus, e.g. Berachot 23:, :ברכות כג. These references always refer to the pagination of the Vilna Talmud. In the Vilna edition of the Talmud there are 5,894 folio pages. Lazarus Goldschmidt published an edition from the "uncensored text" of the Babylonian Talmud with a German translation in 9 vols. (commenced Leipzig, 1897–1909, edition completed, following emigration to England in 1933, by 1936). The text of the Vilna editions is considered by scholars not to be uniformly reliable, and there have been a number of attempts to collate textual variants. In the early 20th century Nathan Rabinowitz published a series of volumes called Dikduke Soferim showing textual variants from early manuscripts and printings. In 1960 work started on a new edition under the name of Gemara Shelemah (complete Gemara) under the editorship of Menachem Mendel Kasher: only the volume on the first part of tractate Pesachim appeared before the project was interrupted by his death. This edition contained a comprehensive set of textual variants and a few selected commentaries. Some thirteen volumes have been published by the Institute for the Complete Israeli Talmud (a division of Yad Harav Herzog), on lines similar to Rabinowitz, containing the text and a comprehensive set of textual variants (from manuscripts, early prints and citations in secondary literature) but no commentaries. There have been critical editions of particular tractates (e.g. Henry Malter's edition of Ta'anit), but there is no modern critical edition of the whole Talmud. Modern editions such as those of the Oz ve-Hadar Institute correct misprints and restore passages that in earlier editions were modified or excised by censorship but do not attempt a comprehensive account of textual variants. One edition, by rabbi Yosef Amar, represents the Yemenite tradition, and takes the form of a photostatic reproduction of a Vilna-based print to which Yemenite vocalization and textual variants have been added by hand, together with printed introductory material. Collations of the Yemenite manuscripts of some tractates have been published by Columbia University. A number of editions have been aimed at bringing the Talmud to a wider audience. The main ones are as follows. The Steinsaltz Talmud, which contains the text with punctuation, detailed explanations and translation. The Steinsaltz Edition is available in two formats: one with the traditional Vilna page and one without. It is available in modern Hebrew (first volume published 1969), English (first volume published 1989), French, Russian and other languages. In May 2012, Koren Publishers Jerusalem launched the new Koren Talmud Bavli, a new version of the Steinsaltz Talmud which features a new, modern English translation and the commentary of rabbi Adin Steinsaltz. This edition won widespread praise as "America's most important Jewish event", and for its "beautiful page" and "clean type". It includes color photos and illustrations, and Steinsaltz's historical, biographical and linguistic notes in modern English translation. Opened as a Hebrew book, this edition preserves the traditional Vilna page layout and includes vowels and punctuation; the Rashi commentary too is punctuated. Opened as an English book, this edition breaks down the Talmud text into small, thematic units and features the supplementary notes along the margins. The Schottenstein Talmud, published by ArtScroll: the first volume was published in 1990, and the series was completed in 2004. Each page is printed in the traditional Vilna format, and accompanied by an expanded paraphrase in English, in which the translation of the text is shown in bold and explanations are interspersed in normal type. The Metivta edition, published by the Oz ve-Hadar Institute. This contains the full text in the same format as the Vilna-based editions, with a full explanation in modern Hebrew on facing pages as well as an improved version of the traditional commentaries. A previous project of the same kind, called Talmud El Am, "Talmud to the people", was published in Israel in the 1960s–80s. The Talmud El Am contains Hebrew text, English translation and commentary by Arnost Zvi Ehrman, with short 'realia', marginal notes, often illustrated, written by experts in the field for the whole of Tractate Berakhot, 2 chapters of Bava Mezia and the halachic section of Qiddushin, chapter 1. The Noé Edition of the Koren Talmud Bavli, Adin Steinsaltz, Koren Publishers Jerusalem. This work was launched in 2012. Opened from the right cover (front for Hebrew and Aramaic books), this edition features the traditional Vilna page with vowels and punctuation in the original Aramaic text. The Rashi commentary appears in Rashi script with vowels and punctuation. Opened from the left cover the edition features bi-lingual text with side-by-side English/Aramaic translation. The margins include color maps, illustrations and notes based on rabbi Adin Steinsaltz’s Hebrew language translation and commentary of the Talmud. Rabbi Tzvi Hersh Weinreb serves as the Editor-in-Chief. As of March 2017, 28 volumes have been published. The entire set will be 42 volumes. The Talmud: The Steinsaltz Edition Adin Steinsaltz, Random House. This work is an English edition of rabbi Steinsaltz' complete Hebrew language translation of and commentary on the entire Talmud. Incomplete—22 volumes and a reference guide. Schottenstein Edition of the Talmud, Mesorah Publications (73 volumes). In this translation, each English page faces the Aramaic/Hebrew page. The English pages are elucidated and heavily annotated; each Aramaic/Hebrew page of Talmud typically requires three English pages of translation and notes. Complete. The Soncino Talmud, Isidore Epstein, Soncino Press (26 volumes; also formerly an 18 volume edition was published). Notes on each page provide additional background material. This translation is published both on its own and in a parallel text edition, in which each English page faces the Aramaic/Hebrew page. It is available also on CD-ROM. Complete. The Talmud of Babylonia. An American Translation, Jacob Neusner, Tzvee Zahavy, others. Atlanta: 1984–1995: Scholars Press for Brown Judaic Studies. Complete. The Babylonian Talmud, translated by Michael L. Rodkinson. (1903, contains all of the tractates in the Orders of Mo'ed/Festivals and Nezikin/Damages, plus some additional material related to these Orders.) This is inaccurate and was wholly superseded by the Soncino translation: it is sometimes linked to from the internet because, for copyright reasons, it was until recently the only translation freely available on the Web (see below, under Full text resources). The Babylonian Talmud: A Translation and Commentary, edited by Jacob Neusner and translated by Jacob Neusner, Tzvee Zahavy, Alan Avery-Peck, B. Barry Levy, Martin S. Jaffe, and Peter Haas, Hendrickson Pub; 22-Volume Set Ed., 2011. It is a revision of "The Talmud of Babylonia: An Academic Commentary," published by the University of South Florida Academic Commentary Series (1994–1999). Neusner gives commentary on transition in use langes from Biblical Aramaic to Biblical Hebrew. Neusner also gives references to Mishneh, Torah, and other classical works in Orthodox Judaism. A c. 1000 CE translation of the Talmud to Arabic is mentioned in Sefer ha-Qabbalah. This version was commissioned by the Fatimid Caliph Al-Hakim bi-Amr Allah and was carried out by Joseph ibn Abitur. There is one translation of the Talmud into Arabic, published in 2012 in Jordan by the Center for Middle Eastern Studies. The translation was carried out by a group of 90 Muslim and Christian scholars. The introduction was characterized by Dr. Raquel Ukeles, Curator of the Israel National Library's Arabic collection, as "racist", but she considers the translation itself as "not bad". In February 2017, the William Davidson Talmud was released to Sefaria. This translation is a version of the Steinsaltz edition which was released under creative commons license. Talmud of the Land of Israel: A Preliminary Translation and Explanation Jacob Neusner, Tzvee Zahavy, others. University of Chicago Press. This translation uses a form-analytical presentation that makes the logical units of discourse easier to identify and follow. This work has received many positive reviews. However, some consider Neusner's translation methodology idiosyncratic. One volume was negatively reviewed by Saul Lieberman of the Jewish Theological Seminary. Schottenstein Edition of the Yerushalmi Talmud Mesorah/Artscroll. This translation is the counterpart to Mesorah/Artscroll's Schottenstein Edition of the Talmud (i.e. Babylonian Talmud). From the time of its completion, the Talmud became integral to Jewish scholarship. A maxim in Pirkei Avot advocates its study from the age of 15. This section outlines some of the major areas of Talmudic study. The earliest Talmud commentaries were written by the Geonim (c. 800–1000, CE) in Babylonia. Although some direct commentaries on particular treatises are extant, our main knowledge of Gaonic era Talmud scholarship comes from statements embedded in Geonic responsa that shed light on Talmudic passages: these are arranged in the order of the Talmud in Levin's Otzar ha-Geonim. Also important are practical abridgments of Jewish law such as Yehudai Gaon's Halachot Pesukot, Achai Gaon's Sheeltot and Simeon Kayyara's Halachot Gedolot. After the death of Hai Gaon, however, the center of Talmud scholarship shifts to Europe and North Africa. One area of Talmudic scholarship developed out of the need to ascertain the Halakha. Early commentators such as rabbi Isaac Alfasi (North Africa, 1013–1103) attempted to extract and determine the binding legal opinions from the vast corpus of the Talmud. Alfasi's work was highly influential, attracted several commentaries in its own right and later served as a basis for the creation of halakhic codes. Another influential medieval Halakhic work following the order of the Babylonian Talmud, and to some extent modelled on Alfasi, was "the Mordechai", a compilation by Mordechai ben Hillel (c. 1250–1298). A third such work was that of rabbi Asher ben Yechiel (d. 1327). All these works and their commentaries are printed in the Vilna and many subsequent editions of the Talmud. A 15th-century Spanish rabbi, Jacob ibn Habib (d. 1516), composed the Ein Yaakov. Ein Yaakov (or En Ya'aqob) extracts nearly all the Aggadic material from the Talmud. It was intended to familiarize the public with the ethical parts of the Talmud and to dispute many of the accusations surrounding its contents. There are many passages in the Talmud which are cryptic and difficult to understand. Its language contains many Greek and Persian words that became obscure over time. A major area of Talmudic scholarship developed to explain these passages and words. Some early commentators such as Rabbenu Gershom of Mainz (10th century) and Rabbenu Ḥananel (early 11th century) produced running commentaries to various tractates. These commentaries could be read with the text of the Talmud and would help explain the meaning of the text. Another important work is the Sefer ha-Mafteaḥ (Book of the Key) by Nissim Gaon, which contains a preface explaining the different forms of Talmudic argumentation and then explains abbreviated passages in the Talmud by cross-referring to parallel passages where the same thought is expressed in full. Commentaries (ḥiddushim) by Joseph ibn Migash on two tractates, Bava Batra and Shevuot, based on Ḥananel and Alfasi, also survive, as does a compilation by Zechariah Aghmati called Sefer ha-Ner. Using a different style, rabbi Nathan b. Jechiel created a lexicon called the Arukh in the 11th century to help translate difficult words. By far the best known commentary on the Babylonian Talmud is that of Rashi (rabbi Solomon ben Isaac, 1040–1105). The commentary is comprehensive, covering almost the entire Talmud. Written as a running commentary, it provides a full explanation of the words, and explains the logical structure of each Talmudic passage. It is considered indispensable to students of the Talmud. Medieval Ashkenazic Jewry produced another major commentary known as Tosafot ("additions" or "supplements"). The Tosafot are collected commentaries by various medieval Ashkenazic rabbis on the Talmud (known as Tosafists or Ba'alei Tosafot). One of the main goals of the Tosafot is to explain and interpret contradictory statements in the Talmud. Unlike Rashi, the Tosafot is not a running commentary, but rather comments on selected matters. Often the explanations of Tosafot differ from those of Rashi. Among the founders of the Tosafist school were rabbi Jacob ben Meir (known as Rabbeinu Tam), who was a grandson of Rashi, and, Rabbenu Tam's nephew, rabbi Isaac ben Samuel. The Tosafot commentaries were collected in different editions in the various schools. The benchmark collection of Tosafot for Northern France was that of R. Eliezer of Touques. The standard collection for Spain was that of Rabbenu Asher ("Tosefot Harosh"). The Tosafot that are printed in the standard Vilna edition of the Talmud are an edited version compiled from the various medieval collections, predominantly that of Touques. Over time, the approach of the Tosafists spread to other Jewish communities, particularly those in Spain. This led to the composition of many other commentaries in similar styles. Among these are the commentaries of Nachmanides (Ramban), Solomon ben Adret (Rashba), Yom Tov of Seville (Ritva) and Nissim of Gerona (Ran). A comprehensive anthology consisting of extracts from all these is the Shittah Mekubbetzet of Bezalel Ashkenazi. Other commentaries produced in Spain and Provence were not influenced by the Tosafist style. Two of the most significant of these are the Yad Ramah by rabbi Meir Abulafia and Bet Habechirah by rabbi Menahem haMeiri, commonly referred to as "Meiri". While the Bet Habechirah is extant for all of Talmud, we only have the Yad Ramah for Tractates Sanhedrin, Baba Batra and Gittin. Like the commentaries of Ramban and the others, these are generally printed as independent works, though some Talmud editions include the Shittah Mekubbetzet in an abbreviated form. In later centuries, focus partially shifted from direct Talmudic interpretation to the analysis of previously written Talmudic commentaries. These later commentaries include "Maharshal" (Solomon Luria), "Maharam" (Meir Lublin) and "Maharsha" (Samuel Edels), and are generally printed at the back of each tractate. Another very useful study aid, found in almost all editions of the Talmud, consists of the marginal notes Torah Or, Ein Mishpat Ner Mitzvah and Masoret ha-Shas by the Italian rabbi Joshua Boaz, which give references respectively to the cited Biblical passages, to the relevant halachic codes and to related Talmudic passages. Most editions of the Talmud include brief marginal notes by Akiva Eger under the name Gilyon ha-Shas, and textual notes by Joel Sirkes and the Vilna Gaon (see Textual emendations below), on the page together with the text. During the 15th and 16th centuries, a new intensive form of Talmud study arose. Complicated logical arguments were used to explain minor points of contradiction within the Talmud. The term pilpul was applied to this type of study. Usage of pilpul in this sense (that of "sharp analysis") harks back to the Talmudic era and refers to the intellectual sharpness this method demanded. Pilpul practitioners posited that the Talmud could contain no redundancy or contradiction whatsoever. New categories and distinctions (hillukim) were therefore created, resolving seeming contradictions within the Talmud by novel logical means. In the Ashkenazi world the founders of pilpul are generally considered to be Jacob Pollak (1460–1541) and Shalom Shachna. This kind of study reached its height in the 16th and 17th centuries when expertise in pilpulistic analysis was considered an art form and became a goal in and of itself within the yeshivot of Poland and Lithuania. 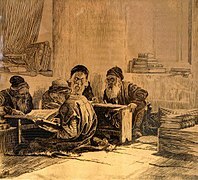 But the popular new method of Talmud study was not without critics; already in the 15th century, the ethical tract Orhot Zaddikim ("Paths of the Righteous" in Hebrew) criticized pilpul for an overemphasis on intellectual acuity. Many 16th- and 17th-century rabbis were also critical of pilpul. Among them may be noted Judah Loew ben Bezalel (the Maharal of Prague), Isaiah Horowitz, and Yair Bacharach. By the 18th century, pilpul study waned. Other styles of learning such as that of the school of Elijah b. Solomon, the Vilna Gaon, became popular. The term "pilpul" was increasingly applied derogatorily to novellae deemed casuistic and hairsplitting. Authors referred to their own commentaries as "al derekh ha-peshat" (by the simple method) to contrast them with pilpul. Among Sephardi and Italian Jews from the 15th century on, some authorities sought to apply the methods of Aristotelian logic, as reformulated by Averroes. This method was first recorded, though without explicit reference to Aristotle, by Isaac Campanton (d. Spain, 1463) in his Darkhei ha-Talmud ("The Ways of the Talmud"), and is also found in the works of Moses Chaim Luzzatto. According to the present-day Sephardi scholar José Faur, traditional Sephardic Talmud study could take place on any of three levels. The most basic level consists of literary analysis of the text without the help of commentaries, designed to bring out the tzurata di-shema'ta, i.e. the logical and narrative structure of the passage. The intermediate level, 'iyyun (concentration), consists of study with the help of commentaries such as Rashi and the Tosafot, similar to that practised among the Ashkenazim. Historically Sephardim studied the Tosefot ha-Rosh and the commentaries of Nahmanides in preference to the printed Tosafot. A method based on the study of Tosafot, and of Ashkenazi authorities such as Maharsha (Samuel Edels) and Maharshal (Solomon Luria), was introduced in late seventeenth century Tunisia by rabbis Abraham Hakohen (d. 1715) and Tsemaḥ Tsarfati (d. 1717) and perpetuated by rabbi Isaac Lumbroso and is sometimes referred to as 'Iyyun Tunisa'i. Today most Sephardic yeshivot follow Lithuanian approaches such as the Brisker method: the traditional Sephardic methods are perpetuated informally by some individuals. 'Iyyun Tunisa'i is taught at the Kisse Rahamim yeshivah in Bnei Brak. In the late 19th century another trend in Talmud study arose. Rabbi Hayyim Soloveitchik (1853–1918) of Brisk (Brest-Litovsk) developed and refined this style of study. Brisker method involves a reductionistic analysis of rabbinic arguments within the Talmud or among the Rishonim, explaining the differing opinions by placing them within a categorical structure. The Brisker method is highly analytical and is often criticized as being a modern-day version of pilpul. Nevertheless, the influence of the Brisker method is great. Most modern day Yeshivot study the Talmud using the Brisker method in some form. One feature of this method is the use of Maimonides' Mishneh Torah as a guide to Talmudic interpretation, as distinct from its use as a source of practical halakha. Rival methods were those of the Mir and Telz yeshivas. As a result of Jewish emancipation, Judaism underwent enormous upheaval and transformation during the 19th century. Modern methods of textual and historical analysis were applied to the Talmud. The text of the Talmud has been subject to some level of critical scrutiny throughout its history. Rabbinic tradition holds that the people cited in both Talmuds did not have a hand in its writings; rather, their teachings were edited into a rough form around 450 CE (Talmud Yerushalmi) and 550 CE (Talmud Bavli.) The text of the Bavli especially was not firmly fixed at that time. —  Teshuvot Geonim Kadmonim, Ed. Cassel, Berlin 1858, Photographic reprint Tel Aviv 1964, 23b. The emendations of Yoel Sirkis and the Vilna Gaon are included in all standard editions of the Talmud, in the form of marginal glosses entitled Hagahot ha-Bach and Hagahot ha-Gra respectively; further emendations by Solomon Luria are set out in commentary form at the back of each tractate. The Vilna Gaon's emendations were often based on his quest for internal consistency in the text rather than on manuscript evidence; nevertheless many of the Gaon's emendations were later verified by textual critics, such as Solomon Schechter, who had Cairo Genizah texts with which to compare our standard editions. In the 19th century Raphael Nathan Nota Rabinovicz published a multi-volume work entitled Dikdukei Soferim, showing textual variants from the Munich and other early manuscripts of the Talmud, and further variants are recorded in the Complete Israeli Talmud and Gemara Shelemah editions (see Critical editions, above). Today many more manuscripts have become available, in particular from the Cairo Geniza. The Academy of the Hebrew Language has prepared a text on CD-ROM for lexicographical purposes, containing the text of each tractate according to the manuscript it considers most reliable, and images of some of the older manuscripts may be found on the website of the Jewish National and University Library. The JNUL, the Lieberman Institute (associated with the Jewish Theological Seminary of America), the Institute for the Complete Israeli Talmud (part of Yad Harav Herzog) and the Friedberg Jewish Manuscript Society all maintain searchable websites on which the viewer can request variant manuscript readings of a given passage. Further variant readings can often be gleaned from citations in secondary literature such as commentaries, in particular those of Alfasi, Rabbenu Ḥananel and Aghmati, and sometimes the later Spanish commentators such as Nachmanides and Solomon ben Adret. Religious scholars still debate the precise method by which the text of the Talmuds reached their final form. Many believe that the text was continuously smoothed over by the savoraim. In the 1870s and 1880s rabbi Raphael Natan Nata Rabbinovitz engaged in historical study of Talmud Bavli in his Diqduqei Soferim. Since then many Orthodox rabbis have approved of his work, including rabbis Shlomo Kluger, Yoseph Shaul Ha-Levi Natanzohn, Yaaqov Ettlinger, Isaac Elhanan Spektor and Shimon Sofer. 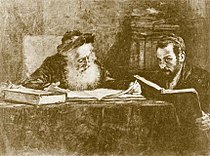 During the early 19th century, leaders of the newly evolving Reform movement, such as Abraham Geiger and Samuel Holdheim, subjected the Talmud to severe scrutiny as part of an effort to break with traditional rabbinic Judaism. They insisted that the Talmud was entirely a work of evolution and development. This view was rejected as both academically incorrect, and religiously incorrect, by those who would become known as the Orthodox movement. Some Orthodox leaders such as Moses Sofer (the Chatam Sofer) became exquisitely sensitive to any change and rejected modern critical methods of Talmud study. 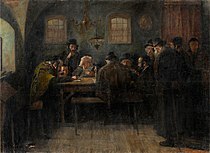 Some rabbis advocated a view of Talmudic study that they held to be in-between the Reformers and the Orthodox; these were the adherents of positive-historical Judaism, notably Nachman Krochmal and Zecharias Frankel. They described the Oral Torah as the result of a historical and exegetical process, emerging over time, through the application of authorized exegetical techniques, and more importantly, the subjective dispositions and personalities and current historical conditions, by learned sages. This was later developed more fully in the five-volume work Dor Dor ve-Dorshav by Isaac Hirsch Weiss. (See Jay Harris Guiding the Perplexed in the Modern Age Ch. 5) Eventually their work came to be one of the formative parts of Conservative Judaism. Another aspect of this movement is reflected in Graetz's History of the Jews. Graetz attempts to deduce the personality of the Pharisees based on the laws or aggadot that they cite, and show that their personalities influenced the laws they expounded. The leader of Orthodox Jewry in Germany Samson Raphael Hirsch, while not rejecting the methods of scholarship in principle, hotly contested the findings of the Historical–Critical method. In a series of articles in his magazine Jeschurun (reprinted in Collected Writings Vol. 5) Hirsch reiterated the traditional view, and pointed out what he saw as numerous errors in the works of Graetz, Frankel and Geiger. On the other hand, many of the 19th century's strongest critics of Reform, including strictly orthodox rabbis such as Zvi Hirsch Chajes, utilized this new scientific method. The Orthodox rabbinical seminary of Azriel Hildesheimer was founded on the idea of creating a "harmony between Judaism and science". Another Orthodox pioneer of scientific Talmud study was David Zvi Hoffmann. The Iraqi rabbi Yaakov Chaim Sofer notes that the text of the Gemara has had changes and additions, and contains statements not of the same origin as the original. See his Yehi Yosef (Jerusalem, 1991) p. 132 "This passage does not bear the signature of the editor of the Talmud!" Orthodox scholar Daniel Sperber writes in "Legitimacy, of Necessity, of Scientific Disciplines" that many Orthodox sources have engaged in the historical (also called "scientific") study of the Talmud. As such, the divide today between Orthodoxy and Reform is not about whether the Talmud may be subjected to historical study, but rather about the theological and halakhic implications of such study. Some trends within contemporary Talmud scholarship are listed below. Orthodox Judaism maintains that the oral Torah was revealed, in some form, together with the written Torah. As such, some adherents, most notably Samson Raphael Hirsch and his followers, resisted any effort to apply historical methods that imputed specific motives to the authors of the Talmud. Other major figures in Orthodoxy, however, took issue with Hirsch on this matter, most prominently David Tzvi Hoffmann. Some scholars hold that there has been extensive editorial reshaping of the stories and statements within the Talmud. Lacking outside confirming texts, they hold that we cannot confirm the origin or date of most statements and laws, and that we can say little for certain about their authorship. In this view, the questions above are impossible to answer. See, for example, the works of Louis Jacobs and Shaye J.D. Cohen. Some scholars hold that the Talmud has been extensively shaped by later editorial redaction, but that it contains sources we can identify and describe with some level of reliability. In this view, sources can be identified by tracing the history and analyzing the geographical regions of origin. See, for example, the works of Lee I. Levine and David Kraemer. Some scholars hold that many or most of the statements and events described in the Talmud usually occurred more or less as described, and that they can be used as serious sources of historical study. In this view, historians do their best to tease out later editorial additions (itself a very difficult task) and skeptically view accounts of miracles, leaving behind a reliable historical text. See, for example, the works of Saul Lieberman, David Weiss Halivni, and Avraham Goldberg. Modern academic study attempts to separate the different "strata" within the text, to try to interpret each level on its own, and to identify the correlations between parallel versions of the same tradition. In recent years, the works of R. David Weiss Halivni and Dr. Shamma Friedman have suggested a paradigm shift in the understanding of the Talmud (Encyclopaedia Judaica 2nd ed. entry "Talmud, Babylonian"). The traditional understanding was to view the Talmud as a unified homogeneous work. While other scholars had also treated the Talmud as a multi-layered work, Dr. Halivni's innovation (primarily in the second volume of his Mekorot u-Mesorot) was to differentiate between the Amoraic statements, which are generally brief Halachic decisions or inquiries, and the writings of the later "Stammaitic" (or Saboraic) authors, which are characterised by a much longer analysis that often consists of lengthy dialectic discussion. It has been noted that the Jerusalem Talmud is in fact very similar to the Babylonian Talmud minus Stammaitic activity (Encyclopaedia Judaica (2nd ed. ), entry "Jerusalem Talmud"). Shamma Y. Friedman's Talmud Aruch on the sixth chapter of Bava Metzia (1996) is the first example of a complete analysis of a Talmudic text using this method. S. Wald has followed with works on Pesachim ch. 3 (2000) and Shabbat ch. 7 (2006). Further commentaries in this sense are being published by Dr Friedman's "Society for the Interpretation of the Talmud". Some scholars are indeed using outside sources to help give historical and contextual understanding of certain areas of the Babylonian Talmud. See for example the works of the Prof Yaakov Elman and of his student Dr. Shai Secunda, which seek to place the Talmud in its Iranian context, for example by comparing it with contemporary Zoroastrian texts. The Talmud represents the written record of an oral tradition. It became the basis for many rabbinic legal codes and customs, most importantly for the Mishneh Torah and for the Shulchan Aruch. Orthodox and, to a lesser extent, Conservative Judaism accept the Talmud as authoritative, while Samaritan, Karaite, Reconstructionist, and Reform Judaism do not. The Jewish sect of the Sadducees (Hebrew: צְדוּקִים) flourished during the Second Temple period. Principal distinctions between them and the Pharisees (later known as Rabbinic Judaism) involved their rejection of an Oral Torah and their denying a resurrection after death. Another movement that rejected the oral Torah was Karaism. It arose within two centuries of the completion of the Talmud. Karaism developed as a reaction against the Talmudic Judaism of Babylonia. The central concept of Karaism is the rejection of the Oral Torah, as embodied in the Talmud, in favor of a strict adherence to the Written Torah only. This opposes the fundamental Rabbinic concept that the Oral Torah was given to Moses on Mount Sinai together with the Written Torah. Some later Karaites took a more moderate stance, allowing that some element of tradition (called sevel ha-yerushah, the burden of inheritance) is admissible in interpreting the Torah and that some authentic traditions are contained in the Mishnah and the Talmud, though these can never supersede the plain meaning of the Written Torah. The collection of controversies, dissertations, and prescriptions commonly designated by the name Talmud possesses for us no authority, from either the dogmatic or the practical standpoint. Some took a critical-historical view of the written Torah as well, while others appeared to adopt a neo-Karaite "back to the Bible" approach, though often with greater emphasis on the prophetic than on the legal books. Within Humanistic Judaism, Talmud is studied as a historical text, in order to discover how it can demonstrate practical relevance to living today. Orthodox Judaism continues to stress the importance of Talmud study as a central component of Yeshiva curriculum, in particular for those training to become rabbis. This is so even though Halakha is generally studied from the medieval and early modern codes and not directly from the Talmud. Talmudic study amongst the laity is widespread in Orthodox Judaism, with daily or weekly Talmud study particularly common in Haredi Judaism and with Talmud study a central part of the curriculum in Orthodox Yeshivas and day schools. The regular study of Talmud among laymen has been popularized by the Daf Yomi, a daily course of Talmud study initiated by rabbi Meir Shapiro in 1923; its 13th cycle of study began in August 2012. The Rohr Jewish Learning Institute has popularized the "MyShiur – Explorations in Talmud" to show how the Talmud is relevant to a wide range of people. Conservative Judaism similarly emphasizes the study of Talmud within its religious and rabbinic education. Generally, however, Conservative Jews study the Talmud as a historical source-text for Halakha. The Conservative approach to legal decision-making emphasizes placing classic texts and prior decisions in historical and cultural context, and examining the historical development of Halakha. This approach has resulted in greater practical flexibility than that of the Orthodox. Talmud study forms part of the curriculum of Conservative parochial education at many Conservative day-schools, and an increase in Conservative day-school enrollments has resulted in an increase in Talmud study as part of Conservative Jewish education among a minority of Conservative Jews. See also: The Conservative Jewish view of the Halakha. 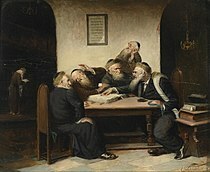 Reform Judaism does not emphasize the study of Talmud to the same degree in their Hebrew schools, but they do teach it in their rabbinical seminaries; the world view of liberal Judaism rejects the idea of binding Jewish law, and uses the Talmud as a source of inspiration and moral instruction. Ownership and reading of the Talmud is not widespread among Reform and Reconstructionist Jews, who usually place more emphasis on the study of the Hebrew Bible or Tanakh. 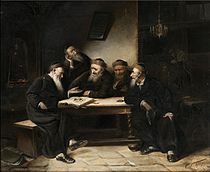 Rabbis and talmudists studying and debating Talmud abound in the art of Austrian painter Carl Schleicher (1825–1903); active in Vienna, especially c. 1859–1871. A Controversy Whatsoever on Talmud. 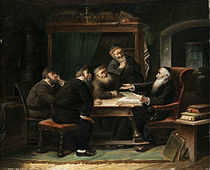 Samuel Hirszenberg, Talmudic School, c. 1895–1908. 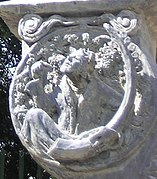 Solomon's Haggadoth, bronze relief from the Knesset Menorah, Jerusalem, by Benno Elkan, 1956. The study of Talmud is not restricted to those of the Jewish religion and has attracted interest in other cultures. Christian scholars have long expressed an interest in the study of Talmud which has helped illuminate their own scriptures. Talmud contains biblical exegesis and commentary on Tanakh that will often clarify elliptical and esoteric passages. The Talmud contains possible references to Jesus and his disciples, while the Christian canon makes mention of Talmudic figures and contains teachings that can be paralleled within the Talmud and Midrash. The Talmud provides cultural and historical context to the Gospel and the writings of the Apostles. South Koreans reportedly hope to emulate Jews' high academic standards by studying Jewish literature. Almost every household has a translated copy of a book they call "Talmud", which parents read to their children, and the book is part of the primary-school curriculum. The "Talmud" in this case is usually one of several possible volumes, the earliest translated into Korean from the Japanese. The original Japanese books were created through the collaboration of Japanese writer Hideaki Kase and Marvin Tokayer, an Orthodox American rabbi serving in Japan in the 1960s and 70s. The first collaborative book was 5,000 Years of Jewish Wisdom: Secrets of the Talmud Scriptures, created over a three-day period in 1968 and published in 1971. The book contains actual stories from the Talmud, proverbs, ethics, Jewish legal material, biographies of Talmudic rabbis, and personal stories about Tokayer and his family. Tokayer and Kase published a number of other books on Jewish themes together in Japanese. The first South Korean publication of 5,000 Years of Jewish Wisdom was in 1974, by Tae Zang publishing house. Many different editions followed in both Korea and China, often by black-market publishers. Between 2007 and 2009, Reverend Yong-soo Hyun of the Shema Yisrael Educational Institute published a 6-volume edition of the Korean Talmud, bringing together material from a variety of Tokayer's earlier books. He worked with Tokayer to correct errors and Tokayer is listed as the author. Tutoring centers based on this and other works called "Talmud" for both adults and children are popular in Korea and "Talmud" books (all based on Tokayer's works and not the original Talmud) are widely read and known. Defenders of the Talmud argue that many of these criticisms, particularly those in antisemitic sources, are based on quotations that are taken out of context, and thus misrepresent the meaning of the Talmud's text and its basic character as a detailed record of discussions that preserved statements by a variety of sages, and from which statements and opinions that were rejected were never edited out. Sometimes the misrepresentation is deliberate, and other times simply due to an inability to grasp the subtle and sometimes confusing and multi-faceted narratives in the Talmud. Some quotations provided by critics deliberately omit passages in order to generate quotes that appear to be offensive or insulting. At the very time that the Babylonian savoraim put the finishing touches to the redaction of the Talmud, the emperor Justinian issued his edict against deuterosis (doubling, repetition) of the Hebrew Bible. It is disputed whether, in this context, deuterosis means "Mishnah" or "Targum": in patristic literature, the word is used in both senses. Full-scale attacks on the Talmud took place in the 13th century in France, where Talmudic study was then flourishing. In the 1230s, Nicholas Donin, a Jewish convert to Christianity, pressed 35 charges against the Talmud to Pope Gregory IX by translating a series of blasphemous passages about Jesus, Mary or Christianity. There is a quoted Talmudic passage, for example, where Jesus of Nazareth is sent to Hell to be boiled in excrement for eternity. Donin also selected an injunction of the Talmud that permits Jews to kill non-Jews. This led to the Disputation of Paris, which took place in 1240 at the court of Louis IX of France, where four rabbis, including Yechiel of Paris and Moses ben Jacob of Coucy, defended the Talmud against the accusations of Nicholas Donin. The translation of the Talmud from Hebrew to non-Jewish languages stripped Jewish discourse from its covering, something that was resented by Jews as a profound violation. The Disputation of Paris led to the condemnation and the first burning of copies of the Talmud in Paris in 1242. [e] The burning of copies of the Talmud continued. The Talmud was likewise the subject of the Disputation of Barcelona in 1263 between Nahmanides (rabbi Moses ben Nahman) and Christian convert, Pablo Christiani. This same Pablo Christiani made an attack on the Talmud that resulted in a papal bull against the Talmud and in the first censorship, which was undertaken at Barcelona by a commission of Dominicans, who ordered the cancellation of passages deemed objectionable from a Christian perspective (1264). At the Disputation of Tortosa in 1413, Geronimo de Santa Fé brought forward a number of accusations, including the fateful assertion that the condemnations of "pagans," "heathens," and "apostates" found in the Talmud were in reality veiled references to Christians. These assertions were denied by the Jewish community and its scholars, who contended that Judaic thought made a sharp distinction between those classified as heathen or pagan, being polytheistic, and those who acknowledge one true God (such as the Christians) even while worshipping the true monotheistic God incorrectly. Thus, Jews viewed Christians as misguided and in error, but not among the "heathens" or "pagans" discussed in the Talmud. Both Pablo Christiani and Geronimo de Santa Fé, in addition to criticizing the Talmud, also regarded it as a source of authentic traditions, some of which could be used as arguments in favour of Christianity. Examples of such traditions were statements that the Messiah was born around the time of the destruction of the Temple, and that the Messiah sat at the right hand of God. In 1415, Antipope Benedict XIII, who had convened the Tortosa disputation, issued a papal bull (which was destined, however, to remain inoperative) forbidding the Jews to read the Talmud, and ordering the destruction of all copies of it. Far more important were the charges made in the early part of the 16th century by the convert Johannes Pfefferkorn, the agent of the Dominicans. The result of these accusations was a struggle in which the emperor and the pope acted as judges, the advocate of the Jews being Johann Reuchlin, who was opposed by the obscurantists; and this controversy, which was carried on for the most part by means of pamphlets, became in the eyes of some a precursor of the Reformation. An unexpected result of this affair was the complete printed edition of the Babylonian Talmud issued in 1520 by Daniel Bomberg at Venice, under the protection of a papal privilege. Three years later, in 1523, Bomberg published the first edition of the Jerusalem Talmud. After thirty years the Vatican, which had first permitted the Talmud to appear in print, undertook a campaign of destruction against it. On the New Year, Rosh Hashanah (September 9, 1553) the copies of the Talmud confiscated in compliance with a decree of the Inquisition were burned at Rome, in Campo dei Fiori (auto de fé). Other burnings took place in other Italian cities, such as the one instigated by Joshua dei Cantori at Cremona in 1559. Censorship of the Talmud and other Hebrew works was introduced by a papal bull issued in 1554; five years later the Talmud was included in the first Index Expurgatorius; and Pope Pius IV commanded, in 1565, that the Talmud be deprived of its very name. The convention of referring to the work as "Shas" (shishah sidre Mishnah) instead of "Talmud" dates from this time. The first edition of the expurgated Talmud, on which most subsequent editions were based, appeared at Basel (1578–1581) with the omission of the entire treatise of 'Abodah Zarah and of passages considered inimical to Christianity, together with modifications of certain phrases. A fresh attack on the Talmud was decreed by Pope Gregory XIII (1575–85), and in 1593 Clement VIII renewed the old interdiction against reading or owning it. The increasing study of the Talmud in Poland led to the issue of a complete edition (Kraków, 1602–05), with a restoration of the original text; an edition containing, so far as known, only two treatises had previously been published at Lublin (1559–76). In 1707 some copies of the Talmud were confiscated in the province of Brandenburg, but were restored to their owners by command of Frederick, the first king of Prussia. A further attack on the Talmud took place in Poland (in what is now Ukrainian territory) in 1757, when Bishop Dembowski, at the instigation of the Frankists, convened a public disputation at Kamianets-Podilskyi, and ordered all copies of the work found in his bishopric to be confiscated and burned. The external history of the Talmud includes also the literary attacks made upon it by some Christian theologians after the Reformation, since these onslaughts on Judaism were directed primarily against that work, the leading example being Eisenmenger's Entdecktes Judenthum (Judaism Unmasked) (1700). In contrast, the Talmud was a subject of rather more sympathetic study by many Christian theologians, jurists and Orientalists from the Renaissance on, including Johann Reuchlin, John Selden, Petrus Cunaeus, John Lightfoot and Johannes Buxtorf father and son. The Vilna edition of the Talmud was subject to Russian government censorship, or self-censorship to meet government expectations, though this was less severe than some previous attempts: the title "Talmud" was retained and the tractate Avodah Zarah was included. Most modern editions are either copies of or closely based on the Vilna edition, and therefore still omit most of the disputed passages. Although they were not available for many generations, the removed sections of the Talmud, Rashi, Tosafot and Maharsha were preserved through rare printings of lists of errata, known as Chesronos Hashas ("Omissions of the Talmud"). Many of these censored portions were recovered from uncensored manuscripts in the Vatican Library. Some modern editions of the Talmud contain some or all of this material, either at the back of the book, in the margin, or in its original location in the text. In 1830, during a debate in the French Chamber of Peers regarding state recognition of the Jewish faith, Admiral Verhuell declared himself unable to forgive the Jews whom he had met during his travels throughout the world either for their refusal to recognize Jesus as the Messiah or for their possession of the Talmud. In the same year the Abbé Chiarini published a voluminous work entitled Théorie du Judaïsme, in which he announced a translation of the Talmud, advocating for the first time a version that would make the work generally accessible, and thus serve for attacks on Judaism: only two out of the projected six volumes of this translation appeared. In a like spirit 19th-century anti-Semitic agitators often urged that a translation be made; and this demand was even brought before legislative bodies, as in Vienna. The Talmud and the "Talmud Jew" thus became objects of anti-Semitic attacks, for example in August Rohling's Der Talmudjude (1871), although, on the other hand, they were defended by many Christian students of the Talmud, notably Hermann Strack. Further attacks from anti-Semitic sources include Justinas Pranaitis' The Talmud Unmasked: The Secret Rabbinical Teachings Concerning Christians (1892) and Elizabeth Dilling's The Plot against Christianity (1964). The criticisms of the Talmud in many modern pamphlets and websites are often recognisable as verbatim quotes from one or other of these. Historians Will and Ariel Durant noted a lack of consistency between the many authors of the Talmud, with some tractates in the wrong order, or subjects dropped and resumed without reason. According to the Durants, the Talmud "is not the product of deliberation, it is the deliberation itself." The Internet is another source of criticism of the Talmud. The Anti-Defamation League's report on this topic states that antisemitic critics of the Talmud frequently use erroneous translations or selective quotations in order to distort the meaning of the Talmud's text, and sometimes fabricate passages. In addition, the attackers rarely provide full context of the quotations, and fail to provide contextual information about the culture that the Talmud was composed in, nearly 2,000 years ago. One such example concerns the line "If a Jew be called upon to explain any part of the rabbinic books, he ought to give only a false explanation. Who ever will violate this order shall be put to death." alleged to be a quote from a book titled Libbre David (alternatively Livore David). No such book exists in the Talmud or elsewhere. The title is assumed to be a corruption of Dibre David, a work published in 1671. Reference to the quote is found in an early Holocaust denial book, The Six Million Reconsidered by William Grimstad. Gil Student, Book Editor of the Orthodox Union's Jewish Action magazine, states that many attacks on the Talmud are merely recycling discredited material that originated in the 13th-century disputations, particularly from Raymond Marti and Nicholas Donin, and that the criticisms are based on quotations taken out of context, and are sometimes entirely fabricated. ^ See, Strack, Hermann, Introduction to the Talmud and Midrash, Jewish Publication Society, 1945. pp. 11–12. "[The Oral Torah] was handed down by word of mouth during a long period... The first attempts to write down the traditional matter, there is reason to believe, date from the first half of the second post-Christian century." Strack theorizes that the growth of a Christian canon (the New Testament) was a factor that influenced the rabbis to record the oral Torah in writing. ^ The theory that the destruction of the Temple and subsequent upheaval led to the committing of Oral Torah into writing was first explained in the Epistle of Sherira Gaon and often repeated. See, for example, Grayzel, A History of the Jews, Penguin Books, 1984, p. 193. ^ As Yonah Fraenkel shows in his book Darko Shel Rashi be-Ferusho la-Talmud ha-Bavli, one of Rashi's major accomplishments was textual emendation. Rabbenu Tam, Rashi's grandson and one of the central figures in the Tosafist academies, polemicizes against textual emendation in his less studied work Sefer ha-Yashar. However, the Tosafists, too, emended the Talmudic text (See e.g. Baba Kamma 83b s.v. af haka'ah ha'amurah or Gittin 32a s.v. mevutelet) as did many other medieval commentators (see e.g. R. Shlomo ben Aderet, Hiddushei ha-Rashb"a al ha-Sha"s to Baba Kamma 83b, or Rabbenu Nissim's commentary to Alfasi on Gittin 32a). ^ Steinberg, Paul; Greenstein Potter, Janet (2007). Celebrating the Jewish Year: The Fall Holidays: Rosh Hashanah, Yom Kippur. The Jewish Publication Society. p. 42. ISBN 9780827608429. ^ Steinsaltz, Adin (2009). "What is the Talmud?". The Essential Talmud (30th anniversary ed.). Basic Books. ISBN 9780786735419. ^ Neusner, Jacob (2003). The Formation of the Babylonian Talmud. Wipf and Stock Publishers. p. ix. ISBN 9781592442195. ^ Safrai, S. (1969). "The Era of the Mishnah and Talmud (70–640)". In Ben-Sasson, H.H. (ed.). A History of the Jewish People. Translated by Weidenfeld, George. Harvard University Press (published 1976). p. 379. ISBN 9780674397316. ^ Goldberg, Abraham (1987). "The Palestinian Talmud". In Safrai, Shmuel (ed.). The Literature of the Jewish People in the Period of the Second Temple and the Talmud, Volume 3 The Literature of the Sages. Brill. pp. 303–322. doi:10.1163/9789004275133_008. ISBN 9789004275133. ^ "Palestinian Talmud". Encyclopædia Britannica Online. Encyclopædia Britannica. 2010. Retrieved August 4, 2010. ^ Eusebius. "XVIII: He speaks of their Unanimity respecting the Feast of Easter, and against the Practice of the Jews". Vita Constantini. III (c. 330 CE). Retrieved June 21, 2009. ^ "Talmud and Midrash (Judaism) :: The making of the Talmuds: 3rd–6th century". Encyclopædia Britannica. Encyclopædia Britannica Online. 2008. Retrieved 28 October 2013. ^ Moshe Gil (2004). Jews in Islamic Countries in the Middle Ages. p. 507. ISBN 9789004138827. ^ Steinsaltz, Adin (1976). The Essential Talmud. BasicBooks, A Division of HarperCollins Publishers. ISBN 978-0-465-02063-8. ^ Singer, Isidore; Adler, Cyrus (1916). The Jewish Encyclopedia: A Descriptive Record of the History, Religion, Literature, and Customs of the Jewish People from the Earliest Times to the Present Day. Funk and Wagnalls. pp. 527–528. ^ e.g. Pirkei Avot 5.21: "five for the Torah, ten for Mishnah, thirteen for the commandments, fifteen for talmud". ^ "Judaic Treasures of the Library of Congress: The Talmud". American-Israeli Cooperative Enterprise. ^ Sáenz-Badillos, Ángel and John Elwolde. 1996. A history of the Hebrew language. pp. 170–171: "There is general agreement that two main periods of RH (Rabbinical Hebrew) can be distinguished. The first, which lasted until the close of the Tannaitic era (around 200 CE), is characterized by RH as a spoken language gradually developing into a literary medium in which the Mishnah, Tosefta, baraitot, and Tannaitic midrashim would be composed. The second stage begins with the Amoraim, and sees RH being replaced by Aramaic as the spoken vernacular, surviving only as a literary language. Then it continued to be used in later rabbinic writings until the 10th century in, for example, the Hebrew portions of the two Talmuds and in midrashic and haggadic literature." ^ Bomberg, Daniel; Rozenṭal, E (21 December 2018). The Talmud editions of Daniel Bomberg. Bomberg. OCLC 428012084. ^ "Treasure Trove". Tablet Magazine. 9 September 2009. ^ "Bomberg Babylonian Talmud Auctions for $9.3 Million". Tablet Magazine. 22 December 2015. ^ Dalin 2012, p. 25. ^ Gottheil & Broydé 1906. ^ Heller 2005, p. 73. ^ Amram 1909, p. 162. ^ Printing the Talmud: a history of the individual treatises p. 239, Marvin J. Heller (1999) "The Benveniste Talmud, according to Rabbinovicz, was based on the Lublin Talmud which included many of the censors' errors"
^ Friedman, “Variant Readings in the Babylonian Talmud — A Methodological Study Marking the Appearance of 13 Volumes of the Institute for the Complete Israeli Talmud’s Edition,” Tarbiz 68 (1998). ^ Amar, Yosef. "Talmud Bavli be-niqqud Temani". Nosachteiman.co.il. ^ Julius Joseph Price, The Yemenite ms. of Megilla (in the Library of Columbia university), 1916; Pesahim, 1913; Mo'ed Katon, 1920. ^ Ackerman, Matthew. “America’s Most Important Jewish Event?”, 'Commentary', June 26, 2012. ^ The other Oz ve-Hadar editions are similar but without the explanation in modern Hebrew. ^ Neusner, Jacob (2011). The Babylonian Talmud: A Translation and Commentary (22-Volume Set ed.). Peabody, Mass: Hendrickson Pub. ISBN 9781598565263. ^ "Introducing: Talmud in Arabic". ynetnews.com. 19 May 2012. ^ "Arab translation of Talmud includes anti-Israeli messages". 2012. ^ "Talmud (William Davidson)". www.sefaria.org. Retrieved 4 June 2017. ^ "With full Talmud translation, online library hopes to make sages accessible". www.jta.org. Jewish Telegraphic Agency. 2017-02-07. ^ As Pirkei Avot is a tractate of the Mishnah, and reached its final form centuries before the compilation of either Talmud, this refers to talmud as an activity rather than to any written compilation. ^ "HebrewBooks.org Sefer Detail: ספר הנר – ברכות – אגמתי, זכריה בן יהודה". ^ For a list see Ephraim Urbach, s.v. "Tosafot," in Encyclopedia of Religion. ^ See Pilpul, Mordechai Breuer, in Encyclopaedia Judaica, Vol. 16, 2nd Ed (2007), Macmillan Reference and H.H. Ben Sasson, A History of the Jewish People, pp. 627, 717. ^ Kol Melechet Higgayon, the Hebrew translation of Averroes' epitome of Aristotle's logical works, was widely studied in northern Italy, particularly Padua. ^ Boyarin, Sephardi Speculation (Hebrew) (Jerusalem 1989). ^ For a comprehensive treatment, see Ravitzky, below. ^ Faur is here describing the tradition of Damascus, though the approach in other places may have been similar. ^ Examples of lessons using this approach may be found here[permanent dead link]. ^ Cf. the distinction in the Ashkenazi yeshivah curriculum between beki'ut (basic familiarization) and 'iyyun (in-depth study). ^ David ben Judah Messer Leon, Kevod Ḥakhamim, cited by Zimmels, Ashkenazim and Sephardim, pp. 151, 154. ^ Chaim Joseph David Azulai, Shem Gedolim, cited Hirschberg, A History of the Jews in North Africa, pp. 125–126. ^ Joseph Ringel, "A Third Way: Iyyun Tunisai as a Traditional Critical Method of Talmud Study", Tradition 2013 46:3. ^ Rav Avraham Yitzchok Ha-Cohen Kook, zt"l, Late Chief Rabbi of Israel (February 17, 2008). "A labor of great magnitude stands before us, to repair the break between the Talmudic deliberations and the halachic decisions... to accustom students of the Gemara to correlate knowledge of all the halacha with its source and reason..." Halacha Brura and Birur Halacha Institute. Retrieved 20 September 2010. CS1 maint: Multiple names: authors list (link) It should not be confused with the halachic compendium of the same name by rabbi David Yosef. ^ For a humorous description of the different methods, see Gavriel Bechhofer's An Analysis of Darchei HaLimud (Methodologies of Talmud Study) Centering on a Cup of Tea. ^ Etkes, Immanuel (2002). The Gaon of Vilna. University of California Press. p. 16. ISBN 978-0-520-22394-3. ^ Solomon Schechter, Studies in Judaism p. 92. ^ Introduction to Sokoloff, Dictionary of Jewish Babylonian Aramaic. The texts themselves may be found at http://maagarim.hebrew-academy.org.il/Pages/PMain.aspx. ^ "אוצר כתבי יד תלמודיים". Archived from the original on 2006-12-12. ^ See under #Manuscripts and textual variants, below. ^ See particularly his controversial dissertation, Mar Samuel, available at archive.org (German). ^ [www.entry.co.il], entry interactive. "Igud HaTalmud". ^ Yaacov Elman (2012). Steven Fine; Shai Secunda (eds.). Shoshannat Yaakov: Jewish and Iranian Studies in Honor of Yaakov Elman. Brill Academic Pub Publishers. ISBN 978-9004235441. Retrieved 11 November 2013. ^ Shai Secunda (2013). The Iranian Talmud: Reading the Bavli in Its Sasanian Context. University of Pennsylvania Press. ISBN 978-0812245707. Retrieved 18 November 2013. ^ "Secular Talmud Study". The City Congregation for Humanistic Judaism. ^ Lakein, Dvora (December 28, 2007). "Chabad Unveils Talmudic Study Program In 15 Cities". New York. Merkos L'inyonei Chinuch. ^ See Schleicher's paintings at MutualArt. ^ "Why Christians Should Study Torah and Talmud". Bridges for Peace. Retrieved July 3, 2006. ^ Hirschfield, Tzofia (2011-05-12). "Why Koreans study Talmud". Jewish World. Retrieved 27 June 2014. ^ Alper, Tim (2011-05-12). "Why South Koreans are in love with Judaism". The Jewish Chronicle. Retrieved 27 June 2014. ^ a b Ross Arbes (June 23, 2015). "How the Talmud Became a Best-Seller in South Korea". The New Yorker. ^ Hyam Maccoby, op. cit. ^ The Talmud: The Steinsaltz Edition, pp. 103–104 Heller, Marvin J. (1999). Printing the Talmud: a history of the individual treatises printed from 1700 to 1750. Basel: Brill Publishers. pp. 17, 166. ^ "Page:Archives israelites 1851 tome12.djvu/647". Wikisource. ^ Durant, Will; Durant, Ariel (2011) . The Story of Civilization: The Age of Faith. Simon & Schuster. p. 388. ISBN 9781451647617. ^ Jones, Jeremy (June 1999). "Talmudic Terrors". Australia/Israel Review. Archived from the original on 2002-03-30. Retrieved 2008-06-12. If any reader doubts the maliciousness, virulence and prevalence of such material in cyber-space, it is well worth a visit to the Internet site known as Talmud Exposé (www.geocities.com/Athens/Cyprus/8815 [now at http://www.oocities.org/athens/cyprus/8815/]), in which Melbourne's David Maddison has performed the Herculean task of responding, one by one, to the hundreds of "anti-Talmud" quotes, lies and themes he has encountered on the Internet. .
^ "The Talmud in Anti-Semitic Polemics" (PDF) (Press release). Anti-Defamation League. February 2003. Archived from the original (PDF) on August 5, 2010. Retrieved September 16, 2010. By selectively citing various passages from the Talmud and Midrash, polemicists have sought to demonstrate that Judaism espouses hatred for non-Jews (and specifically for Christians), and promotes obscenity, sexual perversion, and other immoral behavior. To make these passages serve their purposes, these polemicists frequently mistranslate them or cite them out of context (wholesale fabrication of passages is not unknown).…In distorting the normative meanings of rabbinic texts, anti-Talmud writers frequently remove passages from their textual and historical contexts. Even when they present their citations accurately, they judge the passages based on contemporary moral standards, ignoring the fact that the majority of these passages were composed close to two thousand years ago by people living in cultures radically different from our own. They are thus able to ignore Judaism's long history of social progress and paint it instead as a primitive and parochial religion. Those who attack the Talmud frequently cite ancient rabbinic sources without noting subsequent developments in Jewish thought, and without making a good-faith effort to consult with contemporary Jewish authorities who can explain the role of these sources in normative Jewish thought and practice. ^ Kominsky, Morris (1970). The hoaxers: plain liars, fancy liars, and damned liars. Boston: Branden Press. pp. 169–176. ISBN 978-08283-1288-2. LCCN 76109134. Libbre David 37. This is a complete fabrication. No such book exists in the Talmud or in the entire Jewish literature. ^ Andrew J. Hurley (1991). Israel and the New World Order. Foundation for a New World Order, Santa Barbara: Fithian Press. ISBN 9780931832994. Amram, David Werner (1909). The Makers of Hebrew Books in Italy. Philadelphia: J.H. Greenstone. Dalin, D.G. (2012). The Myth of Hitler's Pope: Pope Pius XII And His Secret War Against Nazi Germany. Regnery Publishing. ISBN 978-1-59698-185-0. Retrieved 27 August 2017. Dan Cohn-Sherbok (1994). Judaism and other faiths. Palgrave Macmillan. ISBN 978-0-312-10384-2. Retrieved 29 August 2011. Fraade, Steven D, "Navigating the Anomalous: Non-Jews at the Intersection of Early Rabbinic Law and Narrative", in Laurence Jay Silberstein; Robert L. Cohn (1994). The Other in Jewish thought and history: constructions of Jewish culture and identity. NYU Press. pp. 145–165. ISBN 978-0-8147-7990-3. Retrieved 29 August 2011. Gottheil, Richard; Broydé, Isaac (1906). "Leo X. (Giovanni De Medici)". Jewish Encyclopedia. Retrieved 27 August 2017. Heller, Marvin J (2005). "Earliest Printings of the Talmud: From Bomberg to Schottenstein" (PDF). Yeshiva University Museum: 73. R. Travers Herford (2007). Christianity in Talmud and Midrash. KTAV Publishing House, Inc. ISBN 978-0-88125-930-8. Retrieved 29 August 2011. Emmanuel Lévinas; Annette Aronowicz (1994). Nine Talmudic readings. Indiana University Press. ISBN 978-0-253-20876-7. Retrieved 29 August 2011. Levy, Richard S., Antisemitism: a historical encyclopedia of prejudice and persecution, Volume 2, ABC-CLIO, 2005. See articles: "Talmud Trials", "Entdecktes Judenthum", "The Talmud Jew", "David Duke", "August Rohling", and "Johannes Pfefferkorn". Hyam Maccoby; Jehiel ben Joseph (of Paris) (1993). Judaism on trial: Jewish-Christian disputations in the Middle Ages. Fairleigh Dickinson University Press. ISBN 978-1-874774-16-7. Retrieved 29 August 2011. A compendium of primary source materials, with commentary. Jonathan Rosen (2001). The Talmud and the Internet: A Journey Between Worlds. Continuum International Publishing Group. ISBN 978-0-8264-5534-5. Retrieved 29 August 2011. Adin Steinsaltz (2006). The essential Talmud. Basic Books. ISBN 978-0-465-08273-5. Retrieved 29 August 2011. Read more here. See also here. Jacob Neusner, Sources and Traditions: Types of Compositions in the Talmud of Babylonia (Atlanta: Scholars Press, 1992). Shalom Carmy (ed.) Modern Scholarship in the Study of Torah: Contributions and Limitations Jason Aronson, Inc.
Wikimedia Commons has media related to Babylonian Talmud. Talmud Bavli (Soncino translation) (English). The Soncino Press translation of the Talmud Bavli in downloadable PDF format. Everything is present except for the index volume and the minor-tractates volumes.About 63% of the translation is also available in the form of ordinary HTML webpages for those who prefer them. Rodkinson English translation See above, under #Talmud Bavli.